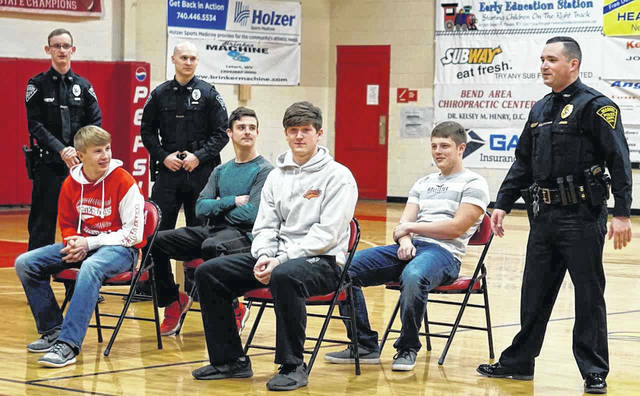 Four students assisted with mock traffic stops by Mason police officers at Wahama, during the presentation “Surviving a Traffic Stop.” Officers pictured, from left, are Clayton Gibbs, Tyler Doss, and Chief Colton McKinney. The “driver” and “passengers” included Jacob Warth, Trevor Hunt, Abram Pauley, and Brady Bumgarner. MASON — Seven tips for “Surviving a Traffic Stop” were given to Wahama High School’s upperclassmen Monday afternoon by officers from the Mason Police Department. Mason Police Chief Colton McKinney, assisted by Officer Tyler Doss and Officer Clayton Gibbs, spoke during the school assembly to sophomores, juniors and seniors. The purpose of the program, McKinney said, is to prepare the teens on what to do, and what not to do, if they are the subject of a traffic stop. The program was initiated after having stopped a few teenagers who did not know where their necessary paperwork was located, who panicked when pulled over, or who had already called someone and was on the phone when the officer approached, he added. First, the chief told the group that the officer making the stop wants it to go as smooth as possible for both the driver and the officer. He said an officer’s goal during the day is to return to family at the end of the shift unharmed and uninjured. The students were also told that kindness and respect to the officer are not required, but go a long way. Following directions, and knowing the location of registration and proof of insurance were among the other tips. Four teens were brought down from the bleachers to assist with two different mock traffic stop scenarios. The first involved the driver borrowing a car from his cousin. After being stopped by police for a traffic violation, a bag of marijuana is found under the seat. The scenario taught the students that no matter who owns the vehicle, the driver is responsible for what is found in the car. Good ideas when being pulled over, according to the chief, are to pull over as soon as possible in a safe location, keeping hands visible, following the officer’s directions, knowing the location of vehicle information, and staying calm and relaxed. On the other hand, bad ideas include refusing to pull over, reaching or hiding hands as the officer approaches, refusing to provide information, not being able to find information, name dropping, and disrespect. McKinney, who also serves on the football coaching staff at the school, and Officer Gibbs are both Wahama graduates. They, along with Officer Doss, often mixed humor in with the program, but also got across the seriousness of the situations. The chief invited the students to come to the police office with any questions or concerns they might have. The officers provided pamphlets to each student with the information contained in the presentation, as well as the driving record point system.